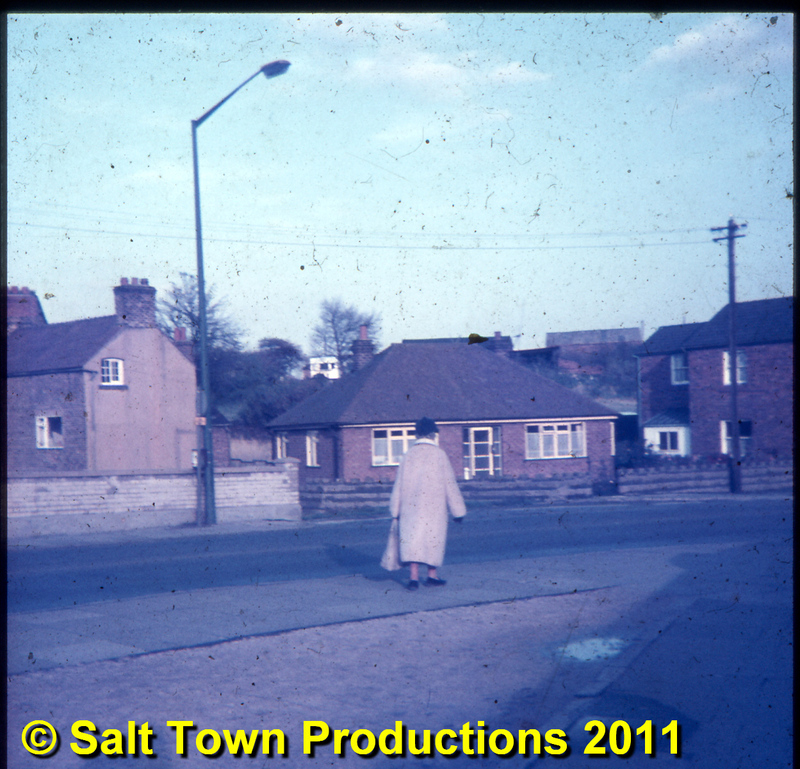 This Agfacolor slide from 1970 shows the lower end of Kinderton Street, where it joins Leadsmithy Street on the Town Bridge. The scene is still very recognisable today, of course, but was a lot less cluttered forty one years ago. On the left is the parapet of the Croco Bridge, made of those off-white bricks we mentioned in this posting and above that is the house (now much gentrified) on the right hand side of Mill Lane (not to be confused with the one off Nantwich Road), which runs down to the mill between the bridge parapet and the bungalow and is now used almost exclusively by anxious car-owners taking their vehicles to fail their MOTs at Town Bridge Motors. The bungalow itself, for many years the abode of Mr and Mrs Dickenson (or was it Dickinson? ), is still there, and on the right we have a tantalizing glimpse of a long gone building which I recall as a disused shop belonging to Percivals the removal company. See this posting. What is striking about the scene in 1970 is the relative tranquility of it all. To take a similar picture today, without a single car in evidence, you'd have to go in the middle of the night. Also absent is any sign of the traffic lights and pedestrian crossings which are now such a feature of the area. But remember, this was before the Kinderton Street redevelopment took place. In fact the traffic lights came on the scene surprisingly late: we have pictures showing the area in 1973 with no sign of them. Also nowhere to be seen are the various tin signs and bric-a-brac advertising cheap MOT tests and the like which came along with Town Bridge Motors. The lady in the centre of the photo was a near neighbour of ours in King Street called Maggie Cannon..
Also in the picture, by the way, is one of the old-style sodium street lamps painted in a discreet MUDC green. Someone once started a scurrilous rumour that, following the adoption by the council of tangerine and delft blue as its official livery, these lamps were to receive similar treatment. Now who would start a silly rumour like that? Something quite extraordinary has happened in this area which makes another 'Now & Then' shot a matter of urgency. The bungalow shown in our slide has been updated in a most surprising and unfortunate manner, with gigantic solar panels being affixed to its roof. Energy efficiency is very desirable, of course, but to say that the solar panels look somewhat out of place on this building is putting it mildly. Perhaps something can be done to disguise the panels in some way? We await developments.